Win a gun in the Small Gauge event! Browning, Briley and Remington have generously donated to this event. The Champion of the Small Gauge event at the 2014 PITA Grand Pacific will have their choice of prizes with other prizes for 2nd and 3rd place. 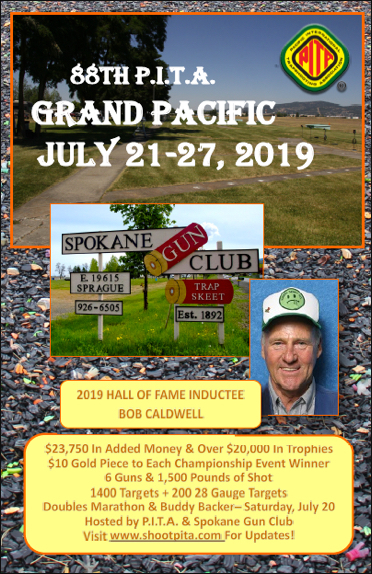 On Wed, Thurs & Fri (July 23-25) mornings enter the 50 target small gauge qualification event (enter as many times as you like to improve your score). The top shooters will shoot off on Saturday, July 26th at 9:00 a.m. for the following prizes – Browning Citori 725-20 ga donated by Browning, Briley tube set donated by Briley and Remington 20 ga ammo donated by Remington. Bring your small gauge gun and join the fun. View all the details on page 36 of the Grand Pacific program (click HERE to view). The Vintage Event has been moved to Thursday, July 24th, but everything else will remain the same as last year. This was a lot of fun for shooters and spectators alike. OSTA will again be selling those delicious Oregon chili topped spuds. To view the program page for the Vintage Shotgun Event click here. The registered event information is posted on the PROGRAMS page. I have no excuse – don’t know what I did but page 75 (Doubles High Averages for Alaska) and page 184 (WA Most Targets) are all wrong!! Not my first mistakes and probably not the last.